This is a powerful analog synth for the money. It does so much for it's size and is an amazing production synthesizer with phrase and step sequencing, a built-in drum machine/rhythm sequencer, an arpeggiator, a 40-band vocoder, stereo effects, and a virtual analog synth engine. It runs for around $400 depending where you look. 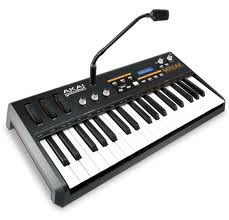 For more info visit Akai here.